I was a little unsure about how the body would be feeling going into this race, considering I was half way through my final build leading into my first Ironman (Ironman Cairns). Due to it being low-tide we weren’t able do a quick warm up swim. I decided to go for a 5-10 minute run in my wet-suit (bare foot) including an upper body dynamic warm up halfway. In hindsight, it wasn’t the best idea to go for a run without shoes because my feet went numb and I wore the material between my thighs on my wetsuit… oops! I felt warm and ready to go after this so I’m glad I did it. While lining up in zone 1 ready for the rolling start to get to me, Pete Murray was doing an awesome job at pumping the crowd up, for some reason, it made me reflect on the journey over the past 6 months on my comeback from surgery with a fractured collarbone. The competitor next to me said something like, “This is the worst part of the day, I just can’t wait to start.” I could barely reply as I was all choked up with emotion thinking about the journey to get to the start line. OK it was GO time, the line was moving quite quickly and I only had a dozen people in front of me. All of a sudden, I was emotionless and only focusing on the task at hand. Thinking about my swim plan with the words of my coach running through my head from our phone call the previous night. I managed to follow my plan throughout the swim focusing on a couple of aspects of my technique which I tend to forget when I’m under pressure. I was able to find some feet after the first turn-around and settle into a nice rhythm. I was almost a little startled at the northern turn-around point when I could hear cheering… on a swim course! Shout out to the people who were out on their yachts giving support. With about 300m left I could hear the voice of Ironman as well as the wonderful Pete Murray’s voice getting louder. As I was running up the ramp I could see Korupt Vision laying on the ground in his wet-suit doing what he does best, I managed a quick “Hi Glen!” while running past placing my goggles on top of my forehead. The BEST part of the day! I looked down at my watch and realised I came out of the swim with a PB! This gave me a boost of confidence as I knew that I wouldn’t have lost too much time to the girls up ahead. I was able to keep within the present moment by consistently thinking about my present power, rpm, position on the bike and getting nutrition/hydration in. I find focusing on these few things helped me stay within the moment. My nutrition on the bike included two bottles each with 2 x CLIF Shot Gels + 1 x Nuun tablet. One bottle with Razz Raspberry CLIF Shot Gel and the other with Lemon Lime CLIF Shot Gel. I had 1 x CrampFix sachet at the 65km mark for prevention purposes and sodium intake. Even though I found this ride extremely bumpy and hard to stay super aero all the time, I seriously couldn’t stop smiling the entire ride and was just SO happy to be out there. I came into T2 with my power plan on point. I also learned that I was 5th female overall and first in my age group posting the second fastest female bike split of the day. I scoffed down 3 x strawberry Clif Bloks and got out of T2 as fast as I could with a huge smile on my face. I seriously had zero expectations for my run considering the block of training we were in. My goal was to run a faster time for the first lap than my second lap. A male age grouper “Deano” and I left T2 together, he seemed to be running at a very consistent pace so I asked kindly if he didn’t mind if I sat behind him, offering him any Clif Bloks or CrampFix if he needed it. At the 8km mark he let me know he was going to start to slow down now and wished me all the best with the rest of the run. Thanks for the company Deano! I was able to keep a consistent pace throughout the first lap and then dropped the pace back roughly 10 sec per km for the second lap. I didn’t have any issues on the run until I got to the 17km mark where I could hear my stomach slugging up and down due to drinking too much water which gave me a stitch in my stomach. It took me about 1km to breathe it out, finally I could pick up the pace again for the final few kilometers. My nutrition over the run course included 4 x strawberry Clif Bloks, a few cups of alternating cola and electrolytes and 3 x CrampFix Sachets. I had the CrampFix sachet’s at the 8km, 12km and 16km mark. I rinsed them down with water but in hindsight I think using only cola to wash it down would have worked better than drinking both water and cola. It was great to trial CrampFix as a preventative in a race situation and a replacement to salt tablets. One sachet of CrampFix has roughly the same amount of sodium as one salt tablet. 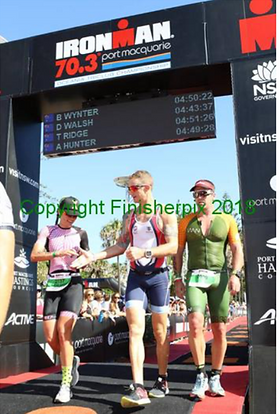 A massive shout out to another male age grouper “Dave Walsh” who pushed me along for the final 1km (which turned out to be 1.5km… we got more than we bargained for searching for that finish line feeling). I love that there is a comradery like spirit out on race day, even though this is an individual sport. 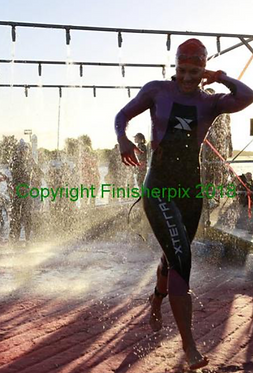 I was over the moon to be able to place 1st in the female 25-29 AG and third female amateur overall. My splits for the day: Swim – 00:30:19 Bike – 02:36:350 Run – 1:38:430 Overall time – 4:49:29. A massive thank you to the following for all your support leading into this race: CrampFix, T:zero Multisport and my amazing coach Richard Thompson, my swim coach – Lisa Spink, Team Clif Bar Australia, Unique Health Products , 17 Hours Tri Clothing and Di’s Fitness & Massage. Back to work for me for the final build leading into my first Ironman! See you all at Cairns. CrampFix Literally Saved My Ironman 70.3 Event! “CrampFix really was a lifesaver, you put a hell of a lot of training hours into those types of events as you know, so it was a massive relief to find a product on course that literally fixed the problem in a minute or so, and enabled me to complete the event. within the first km of the run I was struck with my first EVER leg cramp. I honestly thought my day was over, I had no idea how I would run another 20k. Then I was lucky enough to find CrampFix at the next aid station, and it literally saved my event. I went on to achieve my 70.3 goal. Ever since starting triathlon in 2015 I’ve experienced muscle cramps in almost every race, usually on the run and was finding I’d start to cramp on the bike in a half Ironman too. While walking through the Cairns Ironman Expo in 2017, I came across CrampFix and asked how their product works, what athletes have used it before and what have the athletes said about it. After having a chat to Jan and Michelle, the owners, I decided to buy a couple of bottles. I don’t usually like to try new things on race day but thought I’d just have it there as an “in case of emergency” situation. I carried a bottle in my bento box on the bike and put the other one in my back race suit pocket when I got into Transition 2 for the run. I ended up having a mouthful on the bike around the 60km mark when I could feel the very start of a muscle cramp going on. The cramps stayed at bay until 12km on the run when I could feel another one about to start so I had another mouthful and the cramps disappeared again. CrampFix saved my race and I ended up with a 15 minute personal best time over the Ironman 70.3 distance and 3rd in the Female 25-29 Age Group. I always keep a CrampFix sachet or bottle on me for training and racing now and haven’t looked back. Don’t let annoying muscle cramps ruin your Ironman! CrampFix can help you stay cramp free. All natural, easy to use BREAKTHROUGH CRAMP MANAGEMENT sports supplement. Drinking CrampFix stimulates sensory nerves in the throat which send a signal to inhibit overactive nerves wherever muscles are cramping OR about to cramp. CrampFix is especially developed to help athletes to achieve their performance goals. The QuickFix SHOTS are available in 3 great flavours: Lemon, Raspberry & Espresso. The Espresso included 7mg Caffeine per Shot for an extra HIT! Also in selected sports stores. We strongly recommend you try this product before race day. It does have a strong taste but its easy on the stomach and can be swirled and spit out if preferred. On race day, drink 1 sachet before the race OR before the stage where you think you might cramp. Carry an extra 1 or 2 with you for later in the race to ensure you finish CRAMP FREE! If you have any questions please feel free to email or call us! NEW CrampFix SHOT – Single Serve Sachets with NEW Flavours!! Hot off the machine today are our NEW Raspberry and Espresso QuickFix Shots!! Yes! The Raspberry tastes great!! Same effective CrampFix formula, rapid reliable relief for muscle cramps! New 20ml single serve, tear open sachets! Perfect for runners, cyclists, triathletes or anyone on the move. No mixing, measuring – fits into small pockets. Cristian Homoc, Age 53, First Full Marathon at the Melbourne Marathon. I wish to share my story with all the skeptics out there, as I was a skeptic myself. I recently participated in the 2017 Melbourne Marathon. On the day when I went to pick up the race pack, I saw the CrampFix stand. I had never heard of CrampFix before and honestly, I thought it was just another gimmicky product. I listened to what the the guy had to say about it and left. Something prompted me to google CrampFix and I read the reviews from previous users. That made me decide that paying $10.00 for a bottle, was like buying an insurance policy. You hope that you never need to use it. As it was a reasonable amount, I bought a bottle. On the race day, I put the bottle in my belt pocket, thinking that if I was to need to use it, it would be after the 30km mark. I had a great start and everything appeared to go my way. Except that at about the 3km mark, I started cramping in my right calf (which I had never cramped in before!). I got seriously concerned and slowed down, worrying that I would not be able to finish the race. As I was running more slowly, I managed to put up with the discomfort until about the 12km mark. At that point I used approximately half of the content of the CrampFix bottle, not holding great hopes. It took longer for the effect to take place, than the 30-60 seconds mentioned during the description of the product, a couple of days earlier, but to my surprise, after 1-2km it started working. By the time I passed the 15km point, I was not bothered by the discomfort in the right calf, anymore. I continued the race and took another sip for good measure, at the 30km mark. The rest, which was about 10ml, I took at about the 37km mark. I managed to complete the race slightly outside of my goal of under 4.5 hours, but I believe that CrampFix made the difference between completing and not completing the event. This was my first Marathon (at age 53) and without CrampFix, the event could have been a disappointing experience. Now, I am thinking that for next year’s Melbourne Marathon, I will buy two bottles. I will use some CrampFix before the race (as suggested on the information card), as a preventative measure and I will keep one bottle with me during the race. CrampFix provides athletes a valuable tool to manage muscle cramps. It works neurologically. After taking CrampFix the sensory nerves in the throat are activated to send a signal through the spinal cord to control the overactive nerves where the muscles are cramping. It works rapidly to prevent as well as treat muscle cramps. It is recommended to take CrampFix just 10 minutes before exercise or before expected cramp stage. This will work well to prevent any impending cramps. If cramp does strike CrampFix can be taken to provide rapid relief, allowing athletes to continue to perform. CrampFix is an all natural proprietary formula with a specific Ph level and combination of minerals. It is Gluten Free and Vegan. This was only a few weeks after racing in the Ironman World Championships in Kona, Hawaii. While in Hawaii still, one week after the Ironman Champs, Jason won his Age Group in a 30k running race!! Amazing achievements! “After I placed 4th outright and won my age group at the 30km running race in Hawaii the week after the Ironman I am contemplating going back for the Honolulu Marathon as I’m confident I can win my age group”. Lucky for John Dixon, CrampFix were at the Sports & Lifestyle Expo at the Noosa Triahtlon on the weekend! John has completed the Noosa Triathlon an amazing 28 times!! The last 15 times John suffered from terrible calf cramps in the run leg which probably led him to drop by the CrampFix stand at the Expo just the day before the event. John was advised by CrampFix to keep a bottle in his transition kit and to take approximately 10 to 20ml before heading off on his run with the aim of preventing cramps from coming on. To his pleasant surprise, John did not experience any calf cramps at all on the run leg! This is the email CrampFix received from John, 2 days after the Noosa Triathlon. CrampFix® is a new formulated supplementary sports food especially developed to help athletes to achieve their performance goals. CrampFix® provides the impetus athletes need to increase drive performance. CrampFix® treats muscle cramps through the neuro-muscular system. Instead of treating the cramping muscle itself as most commonly done, CrampFix® treats the overactive NERVES. Just minutes after taking CrampFix®, muscle cramps anywhere in the body are rapidly released. CrampFix helps athletes TAKE CONTROL of muscle cramps. Rapidly. Muscle fatigue combined with overactive nerve signals cause muscles to cramp. Drinking CrampFix® stimulates sensory nerves in the throat. A signal is sent through the spinal cord to inhibit the overactive nerve signals. The overactive signals going from the nerves to the cramping muscle are interrupted. The CRAMP IS RELIEVED or PREVENTED. CrampFix® contains all natural ingredients including vinegar, salt, sugar, water, natural lemon flavour, magnesium, potassium & calcium. This proprietary formula has just the right blend of astringency, pH and mineral content that provides rapid and reliable relief. Drink 10ml (2caps), 5-10 minutes BEFORE exercise to prevent muscle cramps. Drink 15-20ml at FIRST SIGNS of cramping for rapid relief. Drink 10ml AFTER exercise to prevent post exercise muscle cramps. The First Time I Have NOT Cramped Over 42.2km! I wanted to thank you for being at the GC marathon last weekend. It was great to discuss your product at the expo and then see it on course. I have completed 9 marathons, 8 of which I have cramped somewhere late in the race. Much to my pleasure I completed marathon #9 with no cramps. I had a bottle of cramp fix before the start and again at the 38km mark (from you – thanks) and it is the first time I have not cramped over 42.2km! As per my call yesterday happy for you to use my comments. I’ll be ordering again soon! Thanks again and all the best with the business. DO YOU NEED RELIEF FROM MUSCLE CRAMPING? DO YOU NEED SOMETHING TO FIX MUSCLE CRAMPS? PREVENT MUSCLE CRAMPS? CrampFix is an easy to use, fast acting, sports supplement. CrampFix® works through the nervous system by stimulating the sensory nerves in the throat. Pretty simple really! The CrampFix® formula has just the right ingredients (which are all natural, gluten free & vegan) to rapidly relieve and prevent muscle cramps. USE CRAMPFIX® BEFORE, DURING & AFTER EXERCISE. Simply drink 15 to 20ml of the concentrated formula – no dilution or mixing required – OR swirl for approx 30 secs around the mouth and discard. The swirl and spit method is perfect for athletes who have sensitive stomachs or who do not wish to digest extra nutrition. CrampFix Saves Ironman Athletes From Muscle Cramps!